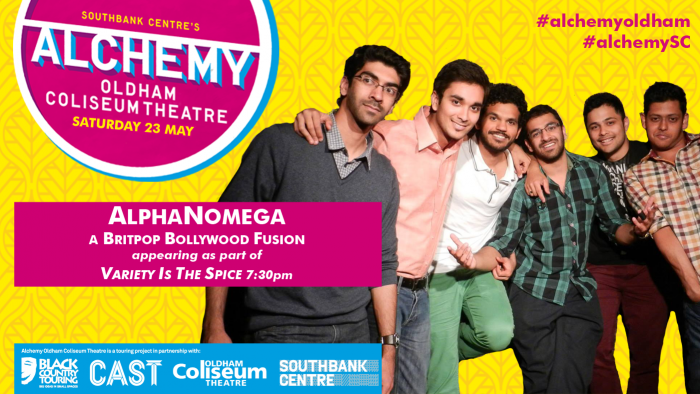 Experience the exciting world of South Asian culture with ALCHEMY - taking place in and around Oldham Coliseum Theatre on 23 May. A wide range of fun-packed events for everyone featuring music, dance, comedy, fashion, literature, art and design plus delicious food markets to savour, this series of one-off collaborations and unique events promise to spice up Oldham like no other event this year! The Coliseum and variety make a perfect partnership that has been enthralling audiences for over a century. With Variety is the Spice, we showcase some of the very best in British Asian talent. 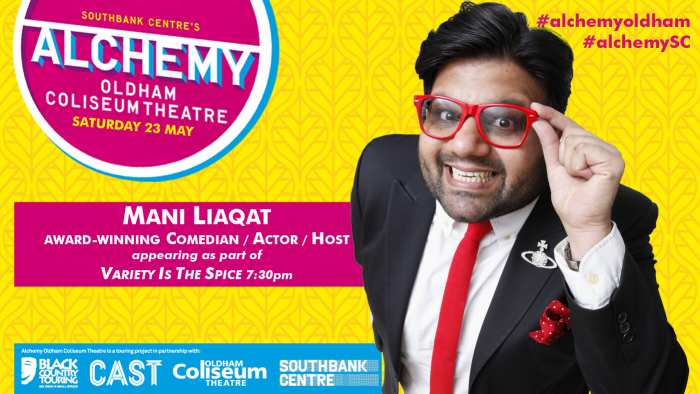 YouTube sensation Hussnain Lahori, Britain’s Got Talent veterans Signature, universal fusion band AlphaNomega and actor/comedian Mani Liaqat join forces for a glitzy night of quality entertainment. Presented by Oldham Coliseum Theatre. For tickets and further information, click here. 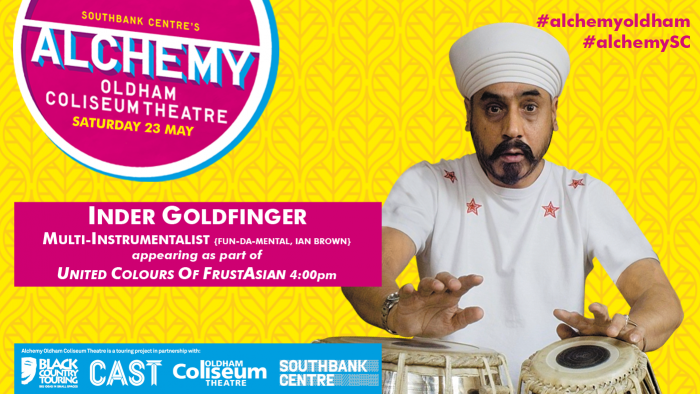 It’s a party that everyone is invited to, as five artists take a witty and poignant journey into their own concepts of identity Featuring performances from Inder Goldfinger (Fun-Da-Mental) and Ezra Khan (Trespass Against Us). Presented by Cast, Doncaster. For tickets and further information, click here. 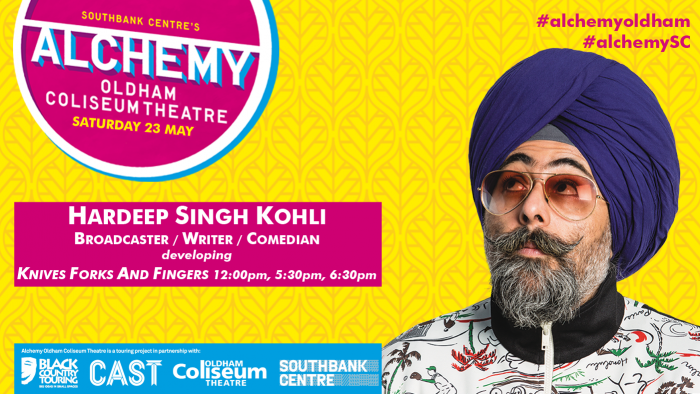 Developed by comic and broadcaster, Hardeep Singh Kohli. There’s a community spirit at the heart of Knives, Forks and Fingers, as The Women’s Chai Morning Group from Oldham and residents of Aksa Homes will be joining storytellers from Doncaster, London and the Black Country to celebrate the timeless bond between generations of women through the filter of food. 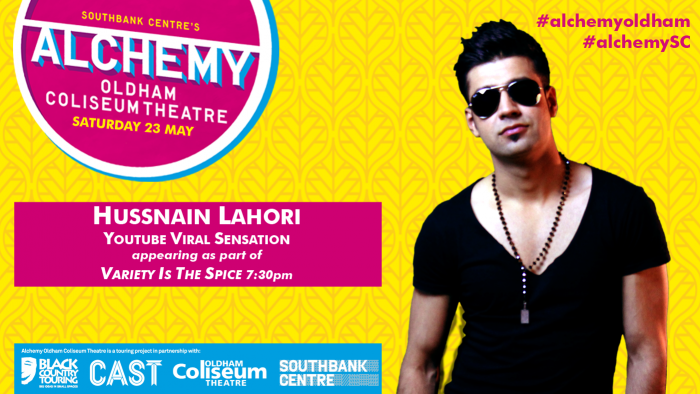 Presented by Southbank Centre. This is free event, but will be ticketed. Further information click here. From the Sonia Sabri Company and Black Country Touring, comes a fusion of Kathak dance, live music, and theatre technique with cutting edge digital technology. Presented by Black Country Touring. For tickets and further information, click here. 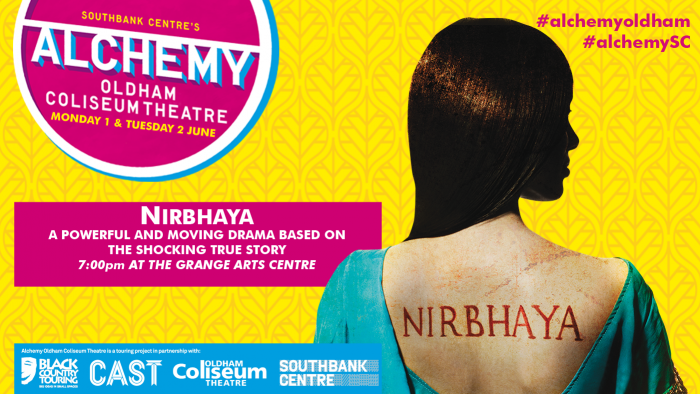 Following rave reviews on both sides of the Atlantic, the dramatization of Nirbhaya’s compelling real life story appears for two nights only at The Grange Arts Centre. 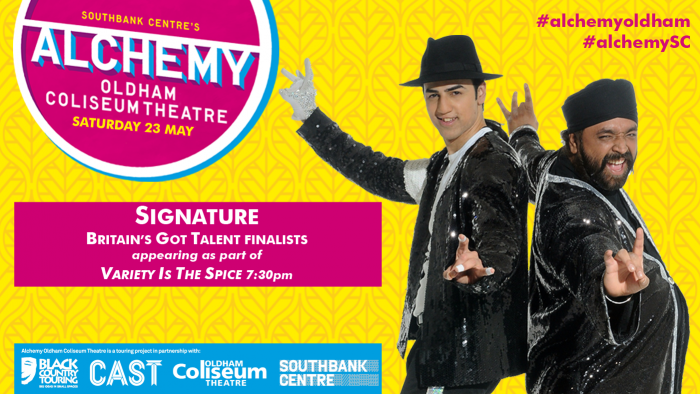 Presented by Southbank Centre. For tickets and further information, click here. 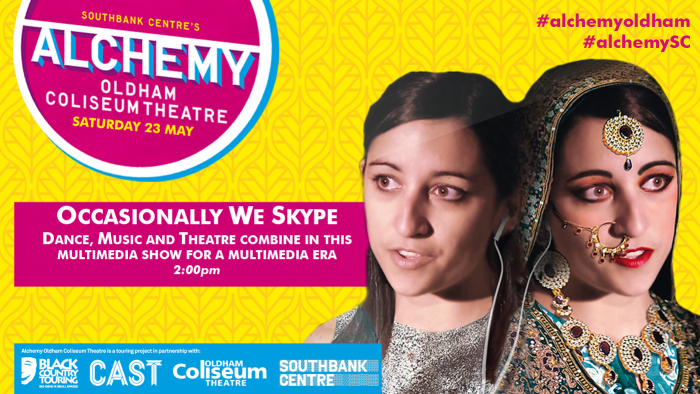 Southbank Centre's Alchemy is an annual festival exploring the cultural links between the UK and South Asia. It celebrates the best of contemporary music, dance, literature, comedy, fashion, art and design through a whole range of events including gigs, talks, exhibitions, workshops, fashion shows and delicious food markets. From AR Rahman to Anoushka Shankar, Kailesh Kher to Sonia Sabri, Jonny Greenwood to Susheela Raman, Alchemy has presented a host of stellar artists, one-off collaborations and groundbreaking premieres, as well as supporting up-and-coming talent. This year, Alchemy goes national. Working with three key national partners, a bespoke Alchemy programme has been devised for regional audiences and these festivals will take place at Cast in Doncaster, Oldham Coliseum Theatre and across venues in the Black Country. For more information, visit southbankcentre.co.uk/alchemy. Alchemy Oldham is supported by Aksa Homes and Sunrise Radio.